Are you stoked for the Samsung Galaxy Note 3? It's one of the most official unannounced products around, and information surrounding the massive handset continues to leak. It looks like we may now be able to pin down a launch date for the device, which Samsung is set to unveil early next month at its "Unpacked" event on September 4th. If the leak posted over at Engadget is to be trusted, the device should ship on September 16th, just a couple weeks after it's revealed. 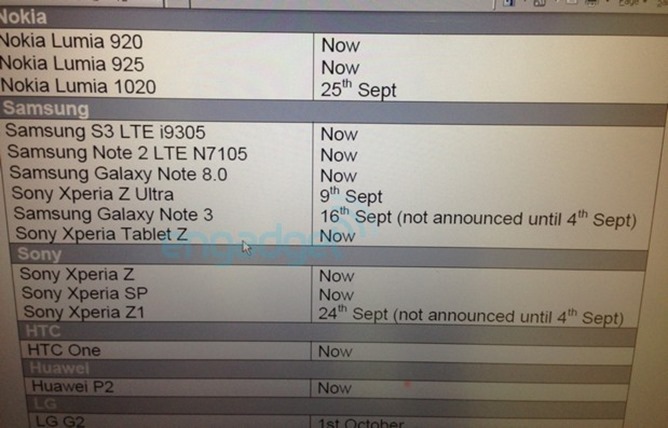 This leak comes from someone who claims to work for Three UK, and it also shows that the Sony Xperia Z1 is set to launch on September 24th. That said, there's no telling if Three UK will get the phones first, and there's the chance that both handsets could ship sooner. Let's also not forget the possibility for delays. Either way, this gives a solid idea of when to start looking for the device on store shelves.